For a simpler look, a metal wedding band is a great, classic option. 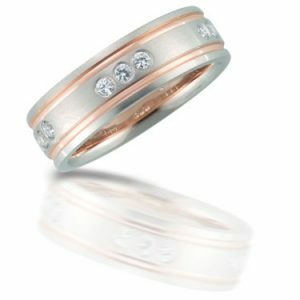 We carry wedding rings for both men and women with and without diamonds or gemstones. We have the option for yellow gold, white gold, platinum or rose gold depending on your preference. We can help you find the perfect wedding band to compliment your engagement ring. For the men, we can help you find a ring that you are comfortable wearing and that fits your lifestyle, budget, and personal style.